While “juicing” through the sewer tunnels beneath Robotropolis, Sonic the Hedgehog (“the world’s most way past cool hedgehog”, in case you didn’t know) laments that he’s lost his way. Behind him, going completely unnoticed, are the Teenage Mutant Ninja Turtles, who are also lost in the sewers. Michelangelo remarks that they’re more lost than they think, as they appear to be in the wrong comic book altogether! 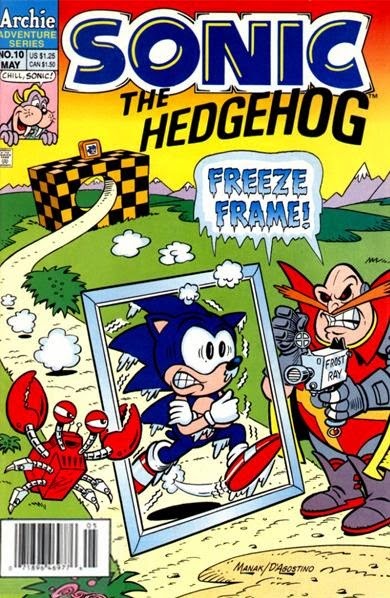 *This issue was reprinted by Archie in Sonic the Hedgehog Archives Vol. 3. All you furries can just calm down already, this was a one-panel gag cameo, not some epic crossover between the two anthropomorphic animal franchises. Under normal circumstances, I’d probably ignore pop culture jokes such as this, as the Turtles also made similar cameos in episodes of “Tiny Toon Adventures” and “Animaniacs” and I’m not about to list every comic or cartoon that’s ever referenced or poked fun at the brand. However, their cameo in Sonic the Hedgehog #10 earns a scrap of extra credibility since Archie Comics had a TMNT comic being published at the same time, so it’s at least a “legal crossover”. And furthermore, I’m really only listing this thing here for completion’s sake and because I don’t feel like writing a full length article right now. I collected everything up until issue #52 when I gave up actively collecting comics as they were released. In my experience, back issues of Sonic are almost impossible to find in comic book shops. I do take offense to the notion that Sonic fans are all furries... but then again, that group (among so many other sections of this fandom...) sadly doesn't help my case. Not that I let those groups diminish my own enjoyment of the franchise, but yeah, they tend to give the rest of Sonic fandom a bad name. 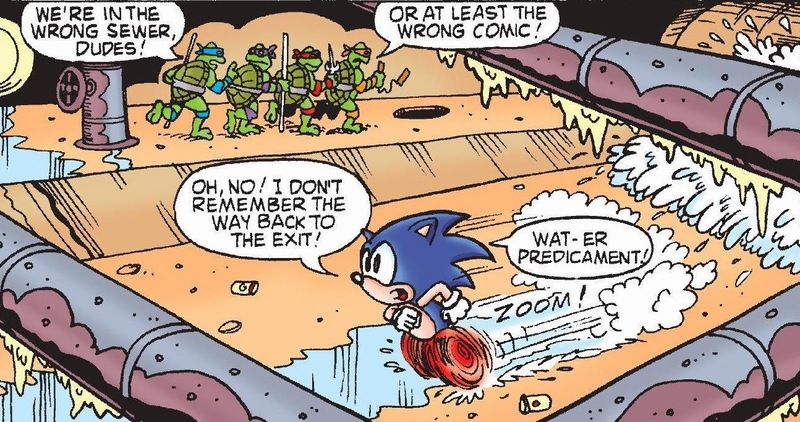 On another note, yeah, those early Sonic books were chalk-full of these sorts of cameos and parodies; I didn't realize even the Turtles made a brief appearance, but I'm not too surprised either (given the time this comic was published and the Turtles being at the height of their popularity in the 90's). I was reminded of this issue today and was wondering if there was at least a copyright notice for the TMNT somewhere in this issue, which would totally cement your "legal crossover" comment. Kinda like how Spider-man got credited in Sega's Revenge of Shinobi game.